Before Completion is a more auspicious oracle than the preceding one, 63, After Completion, which describes an evolution from peace to standstill. When everything is done and all in order, movement stops: "For it is just when perfect equilibrium has been reached that any movement may cause order to revert to disorder." A key metaphor of both hexagrams is of a fox crossing an iced over stream. 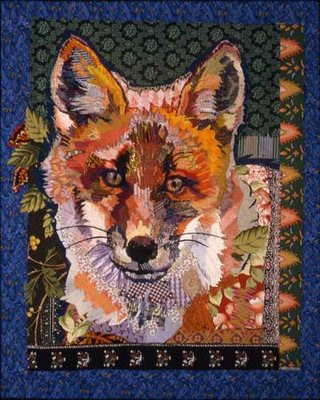 An old fox has the experience, sensitivity and alertness to cross successfully. A young fox may impetuously try to rush things to completion, and wind up with the humiliation of getting its tail wet at the end. "Success. But if the little fox, after nearly completing the crossing, gets his tail in the water, there is nothing that would further...."
Then, after crossing, it's important not to turn back and get your head wet. When it's over, let it be over. Completion calls for the tricky job of differentiating and harmonizing factors that don't easily accord with each other, like fire and water. The text explains that the only way to do this is to be in right relation with ourselves first. "...in order to handle external forces properly, we must above all arrive at the correct standpoint ourselves, for only from this vantage can we work correctly." Working from the correct standpoint in myself on this fire and water piece meant being a beginner. I'd never made anything quite like it before. It kept me surprised the whole time, following unexpected directions from inner guidance, like the idea of hanging one section of the piece from the other. 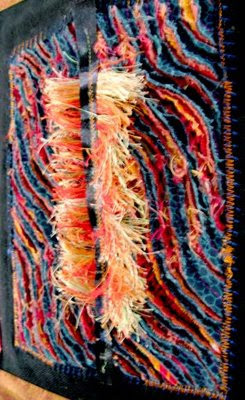 I experimented with a chenille technique and with making fringe out of some special threads (see The Support of Water). I didn't realize the title until the end. After it was "complete" I saw that the fringe suggested a fox's tail. Maybe it also implies the unraveling of ends--things coming and going from one form to another. 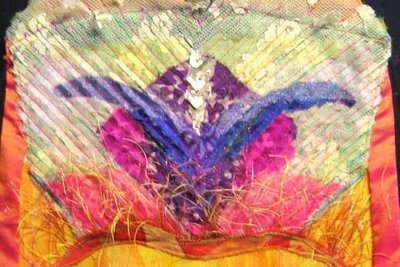 Another recent piece used thread to suggest fire. It also references endings and beginnings in the image of a phoenix, that burns and rises anew from its ashes. 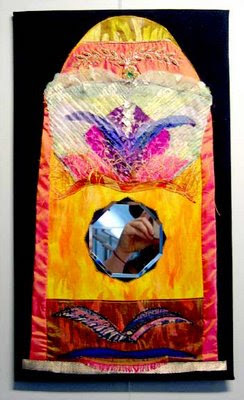 The hexagonal mirror can place your face between incarnations of the phoenix above and below.